On Sunday I browsed through Sabrina Ward Harrison's Spilling Open and was reminded how much I like some of her handwriting styles. I had just a few minutes before leaving for church and I was needing to write a grocery list, so I decided to try out her style. Somehow I got so engrossed in the letter forms that I mixed up red and black. On Monday I went to the doctor to get my cholesterol checked. It took longer than I was expecting, so out came my pen and the only paper I could find a Wal-mart receipt and I sketched the chair across from me. Ten minutes of impatience was turned into ten minutes of enjoyable sketching. I must remember to put some more paper into my purse. I'm still getting lots of mileage from my bill envelopes. 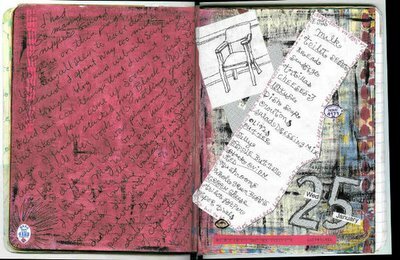 The 25 and the grid paper behind the chair are from one of my favorites. The righ-hand page was done on an advertising circular from the Netherlands. 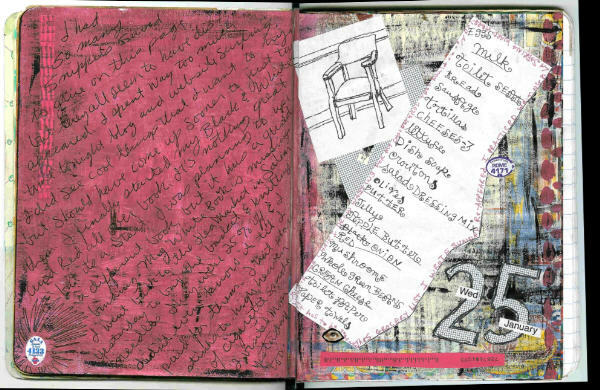 I sewed several pages of it into this journal. Very resourceful with your use of time and junk mail. Good job. I love that red page--a real eye popper. p.s. I keep trying to tag you for the Handmade Tag on PostCrossing, but someone beats me to it. Alas. Gee, I hope your cholesterol comes back okay. I had to adjust to some changes when I got my numbers back, but I get it re-checked in June. Hopefully, I'll have a good report next time.